Roasting seems to be the cooking method of choice for vegetables lately in our flat. Yesterday, I cut a head of broccoli into little florets, tossed them with oil and roasted them at a high heat; after their edges went all brown and crispy, they were tossed into rice cooked with plenty of garlic and oyster sauce. Yum. Sure the roasting broccoli reeked of fart about halfway through cooking but I pressed on and the smell disappeared as the florets browned. But this recipe I knocked together last week won’t stink out your flat. It will instead scent it with the sweetness from roasting onions and peppers and the spice from curry powder (a jar I was gifted that needed using up) and garam masala. All good, not like fart. And couscous is such an excellent lazy person’s carbohydrate; ever since I discovered that you can get away with just pouring over boiling water rather than steaming the grains, well, I was all over it (apparently this is because the couscous sold here has been pre-steamed). Again, this dish makes for a lovely light dinner and keeps extremely well for a packed lunch the next day too. Oh yeah, and blah blah healthy blah blah packed lunch blah blah new year’s resolution. Deseed the peppers and cut into medium sized chunks. Cut the aubergine into medium sized cubes and the courgette into similar sized chunks too. Quarter the onion and then sliced thinly. Toss all the vegetables into a roasting pan and drizzle over the olive oil. Toss together and roast in the oven for about 30 minutes – or until the vegetables are all roasted to your liking. In a large bowl, mix together the dry couscous, teaspoon of olive oil, curry powder, garam masala and a good shake of salt. Pour in one cup of boiling water (same volume as of dry couscous – but refer to your box of couscous if necessary), give it all a good stir, cover and let sit for 10 minutes. After the 10 minutes has elapsed, flake it with a fork until it’s all fluffy. 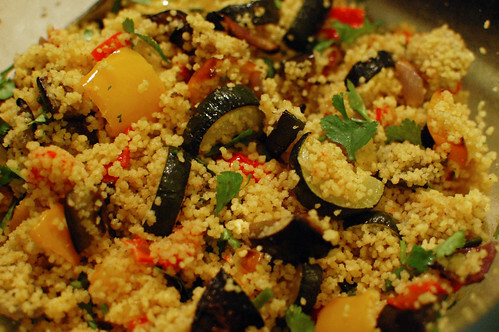 When the vegetables are roasted to your liking, toss them in with the couscous. Chop the fresh coriander and throw that in too. Mix well and serve. love roasting! so easy 🙂 and delish. funny post! I know what you mean about cabbagey smells. Cous cous is the ultimate lazy carb product! I’ve never had it curried but it goes so well with roasted vegetables for dinner or for a cold lunch. The following day. Love couscous. Its my fav. Not only is it an excellent lazy carb product but soo delish too. I always spice it up with chilli, coriander and lots of lemon. Looks fab with the roasted veggie. Yum! shayma: It’s indeed a lovely curry powder (and hot too which was a surprise)! ilse: Oh yes….the smells…. those cruciferous vegetables! Robert: I’m definitely using it more at home! There’s always a box on the counter. Maunika: mmmm…. lemon! Loving the citrus flavours right now. This might be because I’m craving summer! Looks good from the looks of it in the photo. This recipe is new to me but I believe it’s delicious and also healthy. 😉 Thanks for sharing this to us. This is a good menu to everyday lunch pack. This looks so lovely, I would totally come over for dinner for this meal. Great photo! Ara: Very healthy indeed. And yes, excellent for a packed lunch.